Norwegian Trolls | We Love Them But Where Do They Come From? If you’ve ever been to Norway then chances are you’ve seen a troll or maybe a dozen. Travelers visiting Norway might have noticed various Norwegian trolls in their wanderings be it by references, imagery or names. The Trollstigen mountain pass, the Trolltunga rock formation and the Trold-Tindterne peaks are all natural sites in Norway named after their strange national creature. But legends of trolls have been told in Norway for centuries, and some of the stories are wonderfully interesting which is why we all love them so much. When my son and I spent two weeks in Norway a few years ago, we couldn’t help but take in all the trolls and troll tales on our day-to-day adventures. So what did we learn about Norwegian trolls? For one I’ve learned that the gift store version of Norwegian trolls versus the Norse myths are quite different. In myth, trolls that dwell in the forest or the mountainside are brutish creatures. They are the image of trolls that were depicted trying to eat the hobbits in Lord of the Rings. Cave trolls are different in looks; they are short, stubby and have round bellies. They resemble the kind trolls in Frozen – though they too are not so kind in Norway. Myths and legends from ancient ages were handed down orally, so there are many different stories of Norwegian trolls from region to region. Still, there are a few characteristics which apply to all trolls. For example, they don’t like lightning because it can kill them, and they have an aversion to bells – particularly church bells – because they are un-Christian. As such, they seem to be bad spirits that good people have to follow rituals or certain practices to ward off. Some legends say that trolls turn to stone in sunlight. The Trold-Tintern (troll peaks) are thought of as the remains of trolls turned to stone. With the long days of summer, and with trolls in Norway loathing sunlight, they are usually pictured as dark damp creatures who come out in the cold winter. Because trolls are mean and cunning creatures, humans often fall prey to their tricks. So the best defense against a troll has been known to trick them in return. One story tells of a human, named Askeladden, challenging a troll to an eating contest where he cheated and tricked the troll into cutting his stomach open and dying. They are said to be able to smell the blood of a Christian man, and they chase and hunt Christians because they hate them. They have big appetites and are greedy, eating everything from humans to stones. The trolls of Norse mythology are certainly nothing like the kind characters from Frozen! How Can You Uncover Your Own Norwegian Troll Tales? There are many ways travelers to Norway can immerse themselves in its many myths and legends. In big cities and even in rural areas you can find Tarot readings if you ask the right people. This taps into the same eagerness for magic, contact with the supernatural and mysticism. And they are still popular in the country. Kayak or bike tours can include some troll related storytelling if you ask. The Hunderfossen Familiepark is the land of trolls and fairytales in Norway, a must for those wanting to have some family fun in a fairytale venue themed around the strange creatures. You can also find tales of trolls around waterways where it is said trolls carved fjords and waterfalls with their claws. It’s fun to travel and learn about the myths, legends and fairytale creatures that have long been part of a country’s culture. 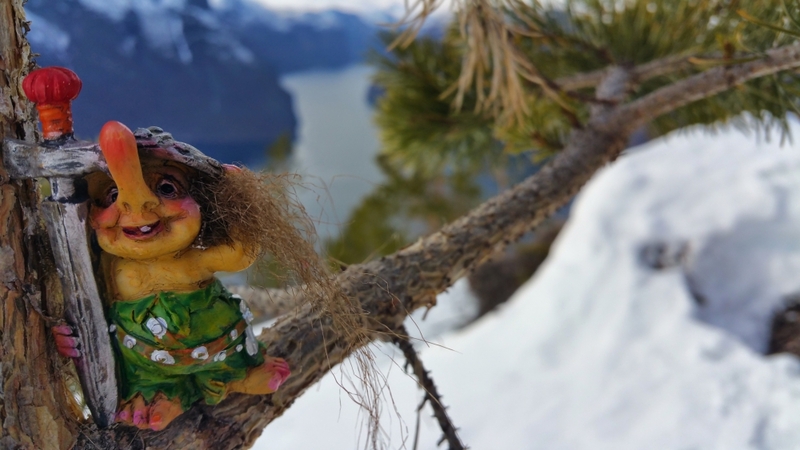 Norwegian trolls have a special place in the hearts of the local people and this folklore fun has carried on through generations, from the names of the rock formations to children’s bedtime stories. Some Norwegians even like to hide troll figures in friends’ gardens as a joke, with the latter repaying the prank. Fairytales may not be a reality, but they spark some magic in the stories we tell and the memories we share, which is one of the reasons we love them.